The Military Reaction Force or MRF was a covert British Army unit which operated in the greater Belfast area during the 1970s, the earliest part of the civil rights-born conflict or Troubles in Britain’s segregationist colony on the island of Ireland. Carrying out London’s more aggressive counterinsurgency policies in the disputed north-eastern region, the forty-strong MRF functioned, in the words of its own members, as a “legalised death squad”. Among its litany of suspected crimes were dozens of murders and attempted murders, which took place in a series of planned assassinations, summary executions and random drive-by attacks on the United Kingdom’s political, civic and communal critics or opponents in “Northern Ireland”. 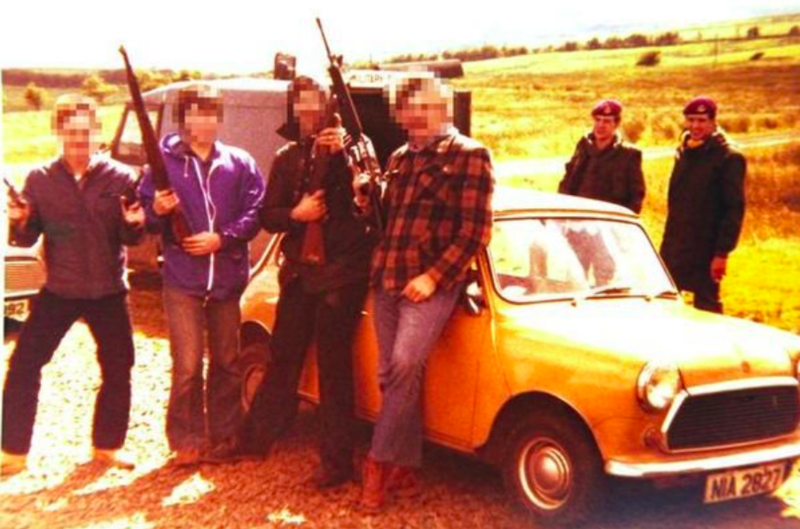 The undercover grouping was supported in its bloody campaign not just by other elements of the UK Armed Forces, the intelligence services – notably the Security Service or MI5 – and the Royal Ulster Constabulary, Britain’s then counterinsurgency police force in the north of Ireland, but also by loyalist or pro-British militant gangs. These included the Ulster Defence Association, aka the Ulster Freedom Fighters, a legal terrorist organisation in the United Kingdom until the early 1990s. A status unique in the history of modern, post-war Western Europe. In November 2013, Britain’s public service broadcaster, the BBC, showed an in-depth television documentary on the hidden record of the Military Reaction Force, tracking down veteran death squad members, some of whom are now living in comfortable retirement in locations as diverse as Canada and Australia. Far from expressing shame for their actions, the MRF men boasted of their exploits as a “terror group”, regaling their interviewers with tales of their government-sanctioned war crimes. The revelations in the BBC Panorama programme, while receiving enormous publicity in Ireland, were largely ignored in the UK. When questioned, former senior British Army commanders defended the bloody record of the MRF, praising its soldiers in heroic terms, while members of the ruling Conservative Party in London and the hibernophobic Democratic Unionist Party in Belfast lined up to laud its counterinsurgency role. The latter grouping has now moved to ensure that the military and paramilitary personnel of the United Kingdom who served in the north-east of Ireland during the three decades of the Long War can never again be quizzed over their past actions. The DUP’s suggested legislation, with the backing of right-wing Tory backbenchers and various far-right groupings, will give retrospective legal immunity to tens of thousands of soldiers, policemen and intelligence officers who fought in the Irish-British Troubles of 1966 to 2005. This will be, in effect, an undeclared general amnesty to ensure that the hidden facets of the Dirty War remain hidden. That the already censored history of the Military Reaction Force and its death squad successors, the Special Reconnaissance Unit (4 Field Security and Intelligence Company), the particularly infamous Force Research Unit, the Special Air Service and the RUC Special Patrol Group, is kept even further away from public scrutiny. The popularity of the campaign in Britain among mainstream politicians and the press to grant legal immunity to those British men (and women) who contributed to the deaths of hundreds of Irish men, women and children from the late 1960s to the early 2000s illustrates the inherent racism of the United Kingdom when it comes to the affairs of Ireland. Simply put, Irish lives don’t matter. And have never done so. Which is a pointed message from London to Dublin on the likely future nature of post-Brexit relations between both island nations.